Like many, Yahushua (Jesus Christ the Messiah) has blessed us with Supernatural experiences of His power and countless Victories in His Mighty Name! We love to post Praise Reports on WOAM’s TESTIMONIES Page, so please share yours - we can add them to encourage others…HalleluYAH, He does WONDEROUS things! Like the time Abba’s angel blazed onto the scene back in 2012. Suddenly, there he stood - back to us – sword high at what was to come! Instantly a snarling demon’s head (the size of the wall) roared into view. The malak (angel) slammed down his sword SMACKING the satanic strongman on the nose like a dog…and that was THAT! Because Elohim has anointed Bill’s eyes to see into spiritual realms he witnessed it all – Although I could not see it, I sure FELT it! HALLELUYAH! Since then Elohim has taught us how to pray to close Dimensional Spiritual Doorways. Nothing like this has happened since – PRAISE YAHUWAH! HE is ever watchful! And there have been more than a few times an unearthly ‘seed’ miraculously, painlessly, moved out through the skin of an abductee after Prayer Liberation…Yes, HE has done marvelous things! And some will remember how Bill shared that, during a horrific tornado several years back a huge malak appeared standing against dark riders in a storm (on the very cusp of a satanic feast)? THAT angel stopped the storm - BAM! - less than three miles away in its tracks! DISCLAIMER: Miracles like these have EVERYTHING to do with Yahushua’s POWER & MERCY, and NOTHING to do with us. We are dust. Like Bill says, ‘I’m just the dust that got to sit up and look around!’ Believe it! Over the years we’ve ministered to many walking wounded filled with inconsolable sorrow (Gal. 6:2)…hearing their sobs reminds us that earth is NOT our home, we are spiritual beings here for a short time, we all need each other and there is much work to be done only the Almighty can accomplish. As a brother and sister in Messiah, we’ve cried and grieved alongside these precious souls and it has taught us that HIS LOVE is, indeed, the greatest Gift of all (I Cor. 13:13). As I write this, even today we pray that Abba has mercy on the families, loved ones and congregation of those slain in the Pittsburgh Synagogue Shooting. BUT WOAM has never been nor will it ever be a bright-lights, Rolls-Royce million-dollar ministry…So why are we are surrounded by angels? Why are we blessed to see countless miracles? Well, we certainly KNOW IT ISN’T US! But miracles do seem to happen more often in the Wilderness – away from crowds (Acts 7:36)…In places where the Almighty gets all the glory. And that’s our goal. That HE gets ALL THE PRAISE and GLORY! Thank Abba, some years ago the Ruach intervened with a still small Voice after I’d cried out those words, whispering clearly, ‘You do not want to die…You want to live. You want a life worth living…SO PRAY THIS INSTEAD - ABBA, GIVE ME A LIFE WORTH LIVING!’ Obediently, I did. Even though my heart wasn’t in it my lips began moving. I prayed every morning even back then, rising early before work to spend time with the Father…But I had so much to learn (still do!) and so much to release in Faith...Within minutes of speaking forth out of love, in obedience, MY THINKING started to change. Slowly over time, things became more clear and I was transformed - although it took renunciation and Prayer Liberation to fully grasp what had transpired. THE POINT: Death is NOT victorious – suffering, loss and pain WAS NOT GIVEN DOMINION - and DOES NOT HAVE DOMINION in a Believer’s life (1 Cor. 15:54-57)! Yahushua bore it all willingly…If we ‘take it back’ through retellings and/or clinging to emotional pain, or ‘stuff it down’ – His Sacrifice is made ‘to no avail’ in those areas of our lives. This sin of omission opens doorways and makes GREAT opportunity for UNRELENTING spiritual and emotional oppression. This is one reason why forgiveness is extremely vital in a Believer’s life (Matt. 18:22-35). The early church knew this. No light shows, blaring music, feel good sermons, holy laughter or mega-churches built on twisted doctrines. They praised Him as the lions tore them apart. Went to the fires singing. 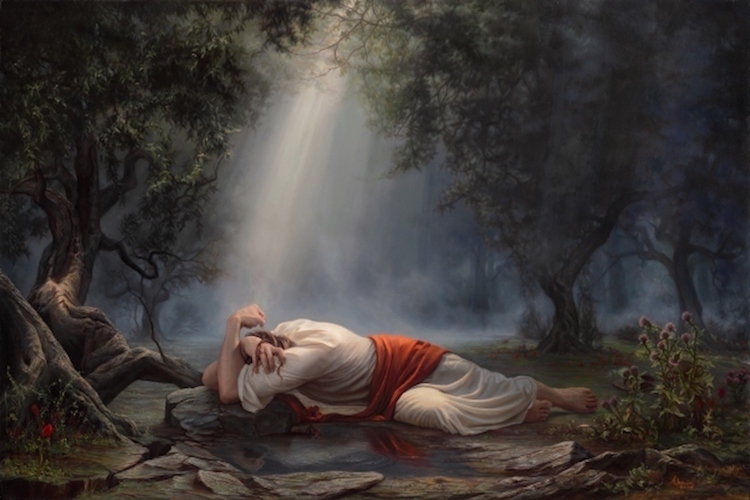 No wonder Yahushua wept, sweating Precious Blood in the garden (Luke 22:44). The Set Apart Spirit showed me something else as I prayed today for the MANY intercessors who reach out to those emotionally crushed, BUT THEN, BECOME EMOTIONALY BOGGED DOWN THEMSELVES. NOTE: Some people have vast Emotional Intelligence (a term created by secular scientists – It’s really an integral part of the Spiritual Gift of Love), that makes them especially sensitive. MANY of these individuals go through life with deep emotional wounds themselves unless they are Born Again, enter into Prayer Liberation and learn to walk the Freedom Road in Messiah. BUT AFTERWARD, many unselfishly reach out to help others and share their stories of faith and VICTORY. Friends, Prayer Warriors like this are indispensable to the Body of Christ! So, when Ruach gave me that lesson on Messiah’s sufferings on Calvary, a door of understanding creaked opened…bringing a flood of tears for all those times I had used the armor of ego to gird myself from the world. HE BORE IT ALL. THIS is why we NEED to lay down our pain and sufferings and NOT ‘GLORY’ IN THEM. NOT TURN BACK to consider the woe of our afflictions!! NOT contemplate our grief for years and years and then, refuse to release our pain to HIM. We must NOT attempt to arrange days and times of heartache and abuse into neat, manageable compartments (which coalesce into a bog of self-focused vain imaginings). Instead, we MUST embrace the PRESENT GLORY of HIS RESURRECTION and TURN AGAIN to HIM! Doing this brings spiritual revelation but requires DISCIPLINE – It is a GIFT we must pray for diligently! WORSHIP – BIND & LOOSE – INTERCEDE – RELEASE! Worship brings us into His Presence (Ps. 100:4). When we intercede, we learn to become OBEDIENT Prayer Warriors. If we are taking up our Cross and following HIM for ourselves, family or others – Worship, obedience, forgiveness and gratitude in Yahushua’s LOVE are the foundations for VICTORY. HE GAVE US THIS MIRACLE on the CROSS and has empowered us through the RUACH haQodesh: His mind, His Spirit – Doing things His Way! But in order to walk in His Ways we must be SEEKERS of His liberation through Prayer, Purity and SANCTIFICATION. THIS is why OBEDIENCE in Love is VITAL (John 14:15). Binding and Loosing must come AFTER the sacrifice of praise. This is submission to HIS Way of doing things, and for Victory we must seek A LEADING from the Ruach haQodesh (Holy Spirit) so we know the BEST WAY TO PRAY for each situation. Without all three, our prayers can fall flat. Remember, we are seeking Him so we can exchange our rags for His Mantle, for His Priestly Garments (Isaiah 61:3)! When we are clothed in the King’s attire of praise, thanksgiving and LIBERATION, THEN His AUTHORITY is ours. WE STAND AS OVERCOMERS. THIS IS WHY the only PAIN we need consider is Yahushua’s pain on Calvary. And YES, it takes time and effort to re-direct your thoughts! THIS IS ALSO binding and loosing of the most sacrificial kind! Not everyone is ready in the same amount of time to begin to see and eventually behold their sufferings are mere shadows in the light of YAHUSHUA. It takes effort and a move of the Ruach. It is through PRAYER, obedience, Bible study, righteous Scriptural counsel and Yahushua’s anointing that Broken people find release and learn to live in HIS Wounds rather than their own. BINDING and LOOSING is necessary as we lay down our glorified sufferings one by one. So for all those devoted parents, grand-parents and family waiting for a miracle – We say, ‘Pray Without Ceasing – Pray His Word Out Loud!’ WOAM has many Spiritual Warfare Prayers online for you to use as a guide that have been proven time and again. We are continually updating prayers as Ruach leads; Please use them, share them, and let us know how your life has been impacted to encourage us and others, too! If you’re interested in more in-depth teaching on emotional deliverance, please watch any number of Dr. Bill’s DVDs, especially DARK ROOTS WITHERED SOULS or HOW JESUS SETS THE CAPTIVES FREE. The Intercessor who is called and anointed is ready and able to ‘stand in the Gap’ for someone else, providing they have been fully equipped by the RUACH. Remember to BIND ALL RETALIATIONS against you, your family, loved ones and the person you are praying for! Far too often Believers step in to intercede for another and end up getting SLAMMED. NOW, I’M NOT SAYING DO NOT INTERCEDE FOR OTHERS! There are as many kinds of intercession as there are people and needs…Just remember to pray something like this in an opening prayer BEFORE Intercession: Abba Yahuwah in Yahushua Messiah’s Name, we come before You and ask that ALL RETALIATIONS – AND ANYTHING WICKED OR UNRIGHTEOUS – Not of Your Tender Mercies and Goodness BE BOUND, HEDGED IN and THWARTED from attacking us and our family, loved ones and also for [Names of Persons You are Interceding for] through all Times, Seasons and Dimensions. Please Abba, apply the Blood, the Stripes and the Name of Yahushua haMossiach over all these people, places and things, and in Yahushua’s Name we petition for the protection for all named, within and without EVERY ASPECT OF THEIR LIVES, family, homes and in all their relationships - in Yahushua’s Name, Omayn! Whether praying for yourself, family or others, even urgent needs must be Released at the Throne of Yahushua’s Mercy (Heb. 4:16). Unfortunately, there are some who refuse to turn away from the confusion and grief of their wounded pasts and continue living in or carrying them. Over time, they learn to ‘survive’ through putting on a mask and often, submerged ANGER…and their emotions take on a life of their own. This ‘other’ identity is called EGO, which STEALS their victory and keeps the pain simmering under the surface…And so the CAUSE, or root of their issue is not healed and a cycle of torment begins. Sadly, we’ve seen it time and again. The wounded pride of ego becomes a vampiric-type egregore that literally drains the life out of them, their families, counselors and friends. YET BLAME must be put on SOMEONE, because the ego cannot let go. It feeds on drama. So…tearfully they retell their stories in evocative ways to themselves and the unsuspecting. They literally turn their ego into a victim all over again, feeding the lie. Beloved, this is the exact opposite of true spiritual empowerment from on High! We MUST NOT turn back (Luke 9:62). We CANNOT dwell in our wounds of the past or fill our minds with the emotionally-numbing horror of remembering or trying to reason it all out. Evil has no purpose or reason except the pleasure of feeding chaos and torment. For every Believer, to focus on devastating abuse and/or mistakes rather than Yahushua’s Word, Life and Example is to miss the mark and lose the battle. Our MINDS and HEARTS (Lev, in Hebrew) MUST be REBUILT through His Love and Mercy. Through Prayer Liberation and the steps outlined here, Yahushua (with the Ruach) can unhitch souls from spiritual and emotional torments and bless us with victory and SHALOM as we abide in the Wounds of Messiah Yahushua. Obedience in Love is His Example. Obedience in Love is Power!